VJ :: Standing on the suspension bridge by the London Eye, I was looking at the hustle and bustle below. 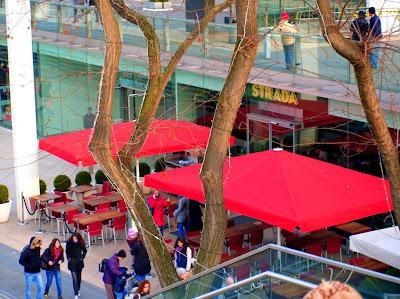 It was a nice and sunny Sunday afternoon and Londoners were making the most of the sunshine by spending time at the cafes. 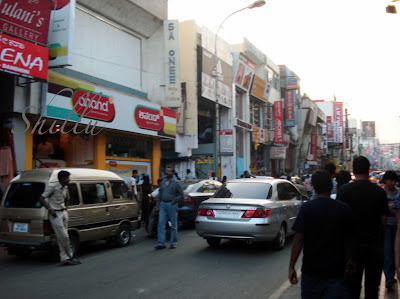 Shillu :: Busiest shopping street in Bangalore - Commercial street. The by lanes of this area are forever packed with shoppers looking for bargains irrespective of the day/time. I love shopping here for the variety of stuff & I love bargaining for a price I think the stuff is worth!